He attended schools here, graduating from Rhinelander High School in 1964. After his schooling Ron went to work for the Rhinelander Paper Company. At the time of his retirement Ron had worked for the paper company for 40 plus years. Ron was a lifelong resident of Rhinelander. Outside of his work, one of the things he enjoyed was traveling. He oftentimes would travel to meet friends, just recently to Arizona, and he would look forward to the yearly trip in March to the South Padre Islands. He loved seeing the Blue Angels and visiting Civil War sites so he often planned his trips to include one or other, or both, if he was lucky. Ron looked forward each year to the Hodag Country Festival. Throughout his life Ron enjoyed all kinds of music, especially live music. It didn't matter what kind of music or what friends and family were there, if it was live music with family and friends, it was a good day. Ron is survived by his son Timothy (Kelly) Smith, his grandchildren, Damon Burke, Megan Sherman, Sydnei Smith and Harper Smith, his stepdaughter Mary (Jeff "Oz") Nelson, his brother Eugene (Cindy Shrank) Smith, nieces, nephews, other family and many friends. He was preceded in death by his parents and his partner Susan Yeater. Private family services will be held for Ron. 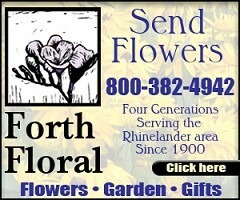 You may leave your private condolences for the Smith family at www.carlsonfh.com. The Carlson Funeral Home (715-369-1414) is serving the Smith family.